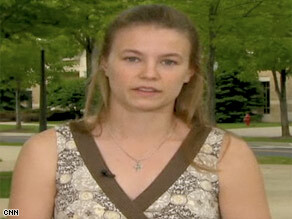 (CNN) -- University of Notre Dame senior Emily Toates, like many in the Catholic faith, is angry over her school's decision to give President Obama an honorary degree at this weekend's commencement. Notre Dame senior Emily Toates says she will not attend her school's main graduation ceremony. She's doing something about it: skipping the event. "I do not feel comfortable going and celebrating him as the university hands him an honorary degree -- in a sense honoring his policies," Toates said. On Sunday, Obama will become one of many sitting U.S. presidents to deliver the commencement address at the Catholic institution. The honor comes much to the chagrin of anti-abortion groups and Catholics protesting the president's pro-choice, pro-stem cell research views. ND Response, an anti-abortion student group that Toates is working with, will boycott the graduation ceremony in protest. Other anti-abortion groups have started petitions against Obama's appearance and have plans to protest his visit to the South Bend, Indiana, campus. "It's not a political issue; this is an issue of human dignity, and it's a Catholic issue," Greer Hannan, a Notre Dame graduating senior, said in a statement. "As a Catholic university, we need to stand up for it." The group said it has received official permission to hold a "prayerful and constructive demonstration" on the university's south quad on graduation day, according to a statement. Notre Dame has said all views are welcome, no matter the speaker's party affiliation. In a statement in March, Notre Dame President John I. Jenkins said that does not mean the university agrees with all of Obama's positions. The White House has said the president is honored to be speaking at the university and welcomes the exchange of ideas on hot-button topics. On Friday, White House Press Secretary Robert Gibbs told reporters that Obama will "obviously make mention of the debate that's been had." "This is a commencement ceremony, a special occasion for families to celebrate ... the president will understand that's the most important aspect of the day," Gibbs said. She said that if Obama had been asked to speak in a different context, the uproar would not be there. It's a point with which one top Catholic agrees. But history and peace studies major Michael Angullo said most students stand behind Notre Dame's invitation even if they don't agree with all of Obama's policies. "Don't think less of the University of Notre Dame," Angullo said. "Don't let this mission be corrupted by a president whose thoughts on this issue are different than Catholic thoughts. Be willing to engage in that." A poll out Thursday suggested that most U.S. Catholics want Notre Dame to allow Obama to speak. Sixty percent of Catholic voters sampled in the Quinnipiac University survey said Notre Dame should not rescind its invitation to the president. Observant Catholic voters who attend religious services about once a week say by a 49 percent to 43 percent margin that Notre Dame should keep Obama on the program. Catholics who attend services less frequently say by a 70 percent to 26 percent margin that Obama should speak, according to the poll. "Neither Americans overall, nor Roman Catholic voters in particular, think Notre Dame should rescind its invitation to President Obama," said Peter Brown, assistant director of the Quinnipiac University Polling Institute. "The strongest opposition to the president's appearance comes from observant Catholics, but more of them than not say he should be allowed to speak." The poll, taken April 21-27, surveyed 2,041 registered voters nationwide. The margin of error is plus or minus 2.2 percentage points. "Catholics are not a monolithic group. If you divide between practicing Catholics and nonpracticing Catholics, you'll find that the practicing Catholics for some reason are opposed to Obama getting an honor. They're not opposed to him speaking at Notre Dame; they're opposed to him being honored," Donohue said.